2018 was again a successful year for the Dorfman Karate group, comprising the Malcolm Dorfman Parktown North Dojo and Shane Dorfman Norwood/Melrose Dojos. With 2018 being the gap year between the 2017 and 2019 KWF World Cup and WSKA World Championship, both events being held every second year, the focus in the ambit of tournament was on National Championships and on the training aspect, a back to basics approach to perfect technique in preparation for the two aforementioned World Championships in 2019. Malcolm Dorfman travelled abroad several times in 2018 to conduct his regular annual international Bujutsu Karate seminars in Germany, England, Scotland and USA. In addition to this, Malcolm was invited to instruct the black belt classes at the KWF World Headquarters in Tokyo, unique recognition for a Westerner. In the same period in Tokyo, Shane Dorfman was personally trained, on invitation, one-on-one, by the world’s greatest Bujutsu Karate master, the legendary icon, Grandmaster Mikio Yahara. While there, major discussions on world karate matters were held between KWF Grandmaster Mikio Yahara and Malcolm Dorfman, in his capacity as KWF Deputy Grandmaster. 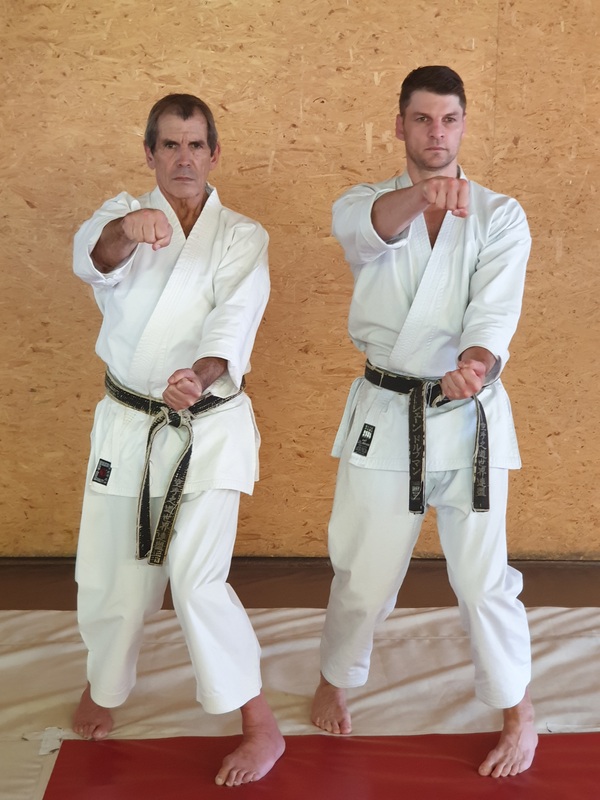 An important decision for South Africa was the agreement by Grandmaster Yahara to conduct a two day seminar in South Africa in March 2019, to be hosted by the Dorfman Karate group. This was a feather in the cap for Dorfman Karate, as the Yahara International Seminars are in great demand worldwide. Due to his worldwide renown as a karate expert and with his medical background as a specialist radiologist, Shane Dorfman was appointed as Director and Head of Martial Arts training of ‘Kids Kicking Cancer’ (KKC) South Africa. ‘Kids Kicking Cancer’ is a global organisation founded in Detroit, USA in 1999 and has presence in over 59 healthcare institutions around the world. KKC uses a combination of martial arts, breathing techniques and meditation to significantly reduce the pain and anxiety of children with a variety of illnesses. Taught by specially trained Black Belts, this programme, empowers and uplifts these children providing them with a sense of power, peace and purpose. The Dorfman Karate group has taken this project to heart, not only the contribution by Shane, but also with the appointment of their senior black belts, 5th Dan Moses Sebopa as Programme Coordinator for Gauteng and 4th Dan Su Dal Col as his Assistant Programme Coordinator, both having undergone special training in the USA. Other Dorfman Karate members are also assisting with this humanitarian project. On the National scene in 2018, Dorfman Karate competitors took the honours in both the KWF SA Adult National Championship and the KWF SA Children’s National Championship. In the former, Dorfman Karate took the most gold medals and titles, viz 7 gold medals plus an additional 8 silver medals and 15 bronze medals. In the latter, again the most gold medals and titles, with 26 gold, 17 silver and 18 bronze medals. Based on these results, so many Dorfman Karate competitors will be eligible to represent South Africa at the two world championships in 2019. A great year which augurs well for this coming year, both nationally and internationally.